A small, toy spear stabs Joan’s hip as she plays with her four-year-old son, Lincoln, in the Dinosaur Discover pit at the zoo shortly before closing time. The sand around the pair is scattered with plastic heroes and villains such as Thor and Loki—foreshadowing the battle for survival about to play out. When Joan initially hears pops like balloons bursting, she is not immediately alarmed. But when she sees “scarecrows” lying on the ground and glimpses a figure armed with a rifle by the women’s bathrooms, Anna grabs her son and runs. 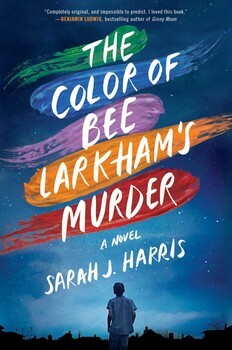 And so it begins—a deadly game of cat and mouse that Joan must play, to save her son from shooters who prowl the grounds in a hunt for human prey. High fences keep animals from escaping, but also trap Joan and Lincoln, while lights are alternatively friends and foe. 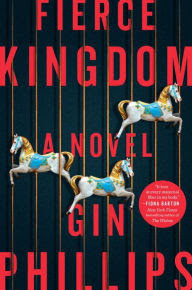 Phillips doesn’t need to use gore to shock the reader—it’s the simple images which are most effective, such as a child’s abandoned sippy cup “spilling a wet liquid.” This is enough to make us imagine the unspeakable horrors unfolding, while reinforcing the fact that Fierce Kingdom is essentially a book about motherhood, and how far a mother will go to save her child. The novel has been optioned for film by Margot Robbie’s LuckyChap Entertainment. Fierce Kingdom is among Mary Kate Carr's eleven recent novels that powerfully tackle gun violence. The Page 69 Test: Fierce Kingdom by Gin Phillips. What is Jeff Wheeler reading? Pg. 69: Nicola Moriarty's "Those Other Women"
Pg. 99: Nora Doyle's "Maternal Bodies"
Pg. 99: Alex Csiszar's "The Scientific Journal"
What is Margaret Bradham Thornton reading? Pg. 69: Jeff Wheeler's "Storm Glass"
What is Stephanie Butland reading? Pg. 69: James Hankins's "A Blood Thing"
Pg. 99: Michael North's "What Is the Present?" What is Lillian Li reading? Pg. 69: E.M. Powell's "The King’s Justice"
Pg. 99: Gideon Yaffe's "The Age of Culpability"
What is Kyle Burke reading? Pg. 99: Philip Thai's "China's War on Smuggling"
What is Demetra Brodsky reading? Pg. 99: Stephen W. Sawyer's "Demos Assembled"
Pg. 69: Anne Frasier's "The Body Counter"
Pg. 69: Eric Bernt's "The Speed of Sound"
What is Yoon Ha Lee reading? Pg. 99: Margarette Lincoln's "Trading in War"
What is Eric Bernt reading? Pg. 69: Demetra Brodsky's "Dive Smack"
Pg. 69: Yoon Ha Lee's "Revenant Gun"
What is Seth Perry reading? What is Liz Rosenberg reading? Pg. 99: Thomas F. Gieryn's "Truth-Spots"
Pg. 69: Amber Royer's "Free Chocolate"
What is Randall Klein reading? Pg. 99: Nicole C. Nelson's "Model Behavior"
Pg. 69: Jenni L. Walsh's "Side by Side"
Pg. 69: Tessa Harris's "The Angel Makers"
What is Caleb Johnson reading? Pg. 69: Megan Bannen's "The Bird and the Blade"
Pg. 99: Yiğit Akın's "When the War Came Home"
What is Peng Shepherd reading?